Ms.Snezana Matijevic, Mayor of the Municipality of Tivat, said that the local government is the place where the problems of minority communities can easily be noticed, but also solved efficiently. She stressed that the aim of the Municipality of Tivat is that all its citizens have equal living conditions and opportunities for advancement. 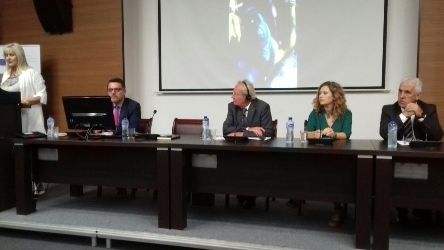 Mr.Refik Bojadzic, Secretary General of the Union of Municipalities and a member of the Project Steering Committee, emphasized that Montenegro inherited all the values ​​and achievements of the protection of human and minority rights and provides a high level of respect of rights. He also stressed that Montenegrin local governments are fully committed to meeting the European standards in this area, and one of them is certainly the Municipality of Tivat. “Thanks to the hard work, good governance and the commitment of local government development of the municipality in the previous period, the Municipality of Tivat has become one of the most successful local authorities in Montenegro today” – said the Secretary General. In addition to intensive economic and infrastructural development, municipality take into account the quality of social and economic life of its citizens. Special attention is paid to the social integration of minorities and in favor is this successfully implemented project, thanks to which the children of Roma and Egyptian population in the municipality are fully included in the education system. Municipality of Tivat has been awarded by the Union of Municipalities and the OSCE by numerous awards for best practices in Montenegro in other areas within the jurisdiction of local government. This project continued in that spirit, and as a confirmation of good work has received one more award and recognition from the Council of Europe for the good care of the minority population. The Secretary General pointed out that this is a good chance for the Municipality of Tivat to share its experience with the municipalities of Montenegro, but also from the region, which are facing with similar challenges in ensuring equal treatment of minorities in the local community. He expressed the conviction that from that municipality other have a lot to hear, see and learn to apply in their municipality. He also commended the Municipality of Kotor and Municipality of Plav, who have successfully implemented projects aimed at preserving the language and cultural identity of minority people in their local communities. “I want that this and similar projects will be implemented in the future, and the positive response of citizens and their satisfaction with the quality of life in the local community are the greatest reward for the effort” – concluded the Secretary General. Mr.Tim Cartwright, head of Council of Europe Office in Belgrade, said that the project of the Municipality of Tivat can be a driving force in the inclusion of Roma children in the education system and in other municipalities, with the counseling of children and their parents is an important factor in this process. Mr.Leon Gjokaj, Director General for the promotion and protection of minority rights in the Ministry for Human and Minority Rights and a member of the Project Steering Committee, said that Montenegro confirmed its intent in ultimate commitment to the protection of human and minority rights. “The one who is most at risk, should be the most supported, and in that sense, the Ministry provides significant financial support to the children of the Roma population, in order as far as possible be included in the educational system” – he concluded. Ms. Mladenka Tesic, Representative Delegation of the European Union in Montenegro emphasized the need to improve communication between state and local authorities with the Roma population in order to build confidence in the key institutions of the system. After the opening speeches, representatives of the Municipality of Tivat have presented all phases of the project, the challenges they faced during the implementation of project activities and results of the project – all children of Roma and Egyptian population in the Municipality of Tivat attend school. The participants of the “Open Day” visited the primary school “Drago Milovic” in which is established the office and counseling for members of RE population and talked with teachers, mediators and parents.